A group of University of B.C. students claiming that political correctness has gone too far has formed a free-speech club in the wake of the U.S. election of Donald Trump as president. But some on campus are concerned that the group, which kicked off its club with members wearing the hat that Trump made famous during his campaign with “Make America Great Again” on it, could lead to the spread of extreme positions. The group members, who say they encouraged people to wear the Trump hats just to provoke debate, argue they aren’t promoting any particular political opinion. They’re just trying to provide a space for unpopular views. “Opinions supporting Trump were a heavily oppressed and marginalized viewpoint on campus. In our club, some members are in favour of Trump and some strongly oppose him, but the important thing is to still have open debates. I mean if Clinton was the one to be marginalized, we would be there wearing the Clinton hat,” said Luka Ostojic, a group administrator. Rima Wilkes, a professor in the UBC department of sociology, said her concern is that a free-speech club, while a good idea in theory, needs to take care that it doesn’t become a place that encourages hate speech. Wilkes said sometimes people push their opinions in an aggressive way, not considering the groups affected by such claims. 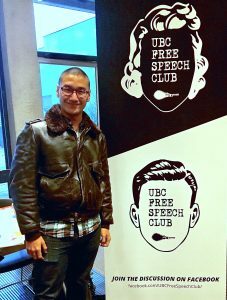 The idea of a free-speech club started with Louis Jung, a student who moved to Vancouver from Korea in September to attend a program at UBC. The club now has more than 130 members. Louis Jung, founder of the UBC Free Speech Club, stands in front of the club advertising. Cooper Asp, the second member of the club, argued that people who have convictions conflicting with the socially acceptable vision feel almost obliged to repress them, so as not to risk to be badly labelled. Through the future events they’ll be hosting, the members of the Free Speech Club hope to give students a chance to be exposed to both the sides of a story, in order to bring ideas that are suppressed to the public and have an open discussion about them. The aim is to provide a space where everyone can feel free to share their ideas and have constructive debates with those who think differently. A professor who specializes in social movements said that kind of airing of ideas from very difficult viewpoints is helpful. “It is difficult to argue against positions you are opposed to if you do not really understand them. Also, to some extent, people who want to change the world need to talk with people they disagree with,” said David Tindall. However, he had one warning. Starting in January, a number of meetings will be organized for both the members of the club and other students. Every week, different topics will be addressed and at the end of each meeting there will be a question-and-answer session.